‘Thou art a soul in bliss’. 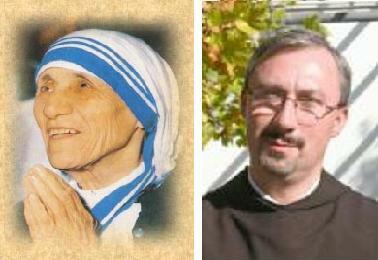 In last week’s blog, Father Jonathan wrote a moving account on the subject of ‘Purity of Heart’, and something of the life and sufferings of Blessed Chiara Luce Badano, who died in her late teens of a terrible cancer. Purity of Heart is what I would call the ultimate goal of those who wish to love God with their whole mind, whole soul and with all their heart. Of such holy people, any observer may well be able to say, “Thou art a soul in bliss”. One can point to others, in recent news items, who have also become ‘blissful souls’ – Blessed John Henry Newman, who was also beatified just a few days before Chiara Luce, (September 2010), and, as I understand it, the process of beatification of Pope John Paul II is already well underway for the summer of 2011, Mother Teresa of Calcutta, and within our own life-times, we have seen the canonisations of holy men and women, Padre Pio, Father Damien of Hawaii, Maximilian Kolbe, Maria Faustina Kowalska … .. the list is constantly growing … .. and seemingly at an increasing pace. The second image does not bear thinking about, but think about it we must. The parable, given by Jesus, was given for a purpose – a very serious and meaningful purpose. We cannot, and must not, ignore it, as if it were some story without intent. 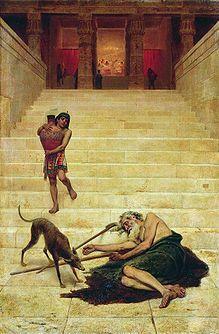 Having made the point that there are many people who enjoy God’s favour – favour in the world today – we can also see many examples of the ‘Rich Man’, who ignored Lazarus’ pleas when he was barely alive and starving, when he would willingly have eaten the leavings from the Rich Man‘s table, scraps that were given to the dogs. We can see many examples of people turning their backs on God and, by their actions, saying: ‘I do not want to be your friend – you are nothing to me – I do not believe in you’. We can see many examples of people, who, through their pursuit of riches, power – self-advancement of all kinds – turn their backs on those-in-need in the world, ‘dishing out’ slavery, injustice, deprivation, inhumanity – even genocide – to millions ‘tagged’ with the name ‘Lazarus’. 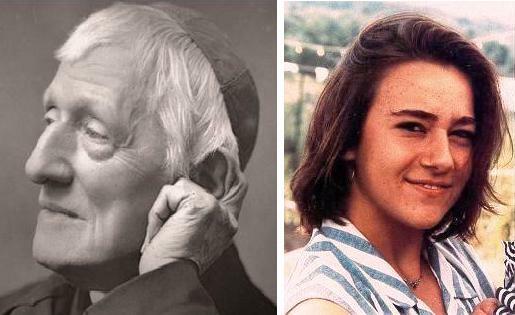 Of course, this rejection of God and His love, is the essence of sin – and we are all sinners – even those blessed with sainthood. Well, that’s a depressing note to hit! We began with those who, through purity of heart, can be seen as souls in bliss, and now, we’ve hit rock-bottom – we’re back to sinners and sinning! But, it need not stay like that. We have one great ally on our side. Jesus came to live as a man among us. He came for one reason, and one reason only – to free us from sin and eternal enmity towards God – and this gives us hope, and a promise of a bright future, if only we will accept him and his great gift – the gift of himself in self-sacrifice – pure atonement for all our sins.